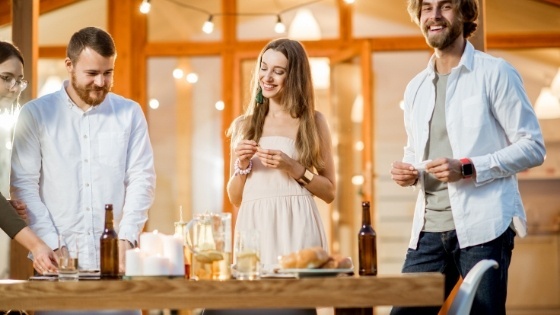 Have you been toying with the idea of about buying a home with a friend or a couple of friends? Perhaps sharing a vacation home in someplace any, oh, like maybe Palm Desert or Palm Springs? Well, that's probably a great idea, but it's important to understand all the pros and cons to buying a home with a friend. Here's what you should know if you've been contemplating buying property or vacation home with a friend or several friends. Will you qualify for a home loan? Of course, the initial benefit to buying a home with other people is the ability to split the down payment and the monthly mortgage payment to make it more affordable. But qualifying for that mortgage can depend on each buyer's credit history, report, and score. If one person doesn't match up, the others may or may not be able to carry that person. Since you will all be on the mortgage, everyone's credit reports will be used by the lender. One person's bad credit score can negatively affect the mortgage terms including the interest rate. You want to make sure that everything you do is in writing and is legal. It is easy to get lax when dealing with friends but you never know when things could fall apart. Trust me, even if you've been best friends with this person for decades, going into business with them, which is what this is, can really throw things off. Having everything in writing and putting emotions aside during the legality of the situation will make everything work much better for those just in case scenarios. It's important to lay down ground roles and have co-ownership agreements. These documents are technically the prenuptial agreements of home ownership and they are some of the only ways to resolve ownership issues in court proceedings. Of course, nobody wants to have to deal with that, but if for some reason, something falls through, it's important to have everything in writing as a backup. When you buy a home with a new person it's important for everyone to do their part financially as well as maintaining the home. Make sure that everything is in writing and everyone keeps up to their into the bargain. It's also important to put in a stipulation as to what could happen if the documents are not followed through to the letter or someone bails on their end of the bargain. One of the biggest challenges of buying a home with friends happens after the purchase. How will you split the living arrangements? Will you live there at the same time or do you want privacy? Are you using this is a vacation home and will there be set dates and times throughout the year that each person can use the property? Compatibility is key and it's important to set forth the rules on cooking, cleaning, housework, and social planning. Even before you start, it's a good idea to set forth ground rules on ending the arrangement. That could be mutually ending it or if you all have a falling out. People's lifestyles change, people move, get married, have kids, change jobs, etc. and all of these things can affect your ability to maintain the house financially and physically. It's important to have an exit strategy just in case. Read More: Can I Use Sweat Equity as a Down Payment? I have some excellent vacation opportunities that would be ideal for people buying a home with friends throughout the Palm Springs, Indio, and Palm Desert area. Give me a call and let's go over some of your options and finances to find a property that works for you and your friends.